HOUSTON – September 6, 2018 – Coats Rose, P.C., a leading business transaction and litigation law firm, has been awarded the Construction Lawyers Society of America Law Firm Award for the second year in a row at the 2018 CLSA International Conference & Induction of Fellows. Held in Banff, Alberta, Canada, the awards recognize North American law firms for excellence in construction law. Coats Rose director, Richard “Rick” Reed, and of counsel, Brad L. Sklencar, are both Fellows of the CLSA. Construction law has been a cornerstone of Coats Rose’s practice for more than 30 years, with experienced attorneys in all types of construction projects, including single-family residential development, large scale commercial, and civil and industrial construction. 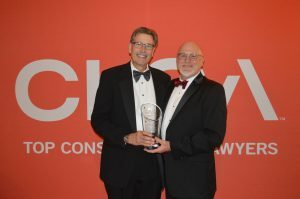 2018 CLSA Executive Director Timothy M. Fulmer presented Rick Reed with the CLSA Law Firm Award, awarded to Coats Rose, P.C. for excellence in construction law. The CLSA is an invitation-only international honorary association composed of preeminent lawyers specializing in construction law and related fields. The organization is dedicated to promoting superior advocacy and ethical standards in construction law, and fostering a scholarly and advanced exchange of ideas in all practices related to the specialty.